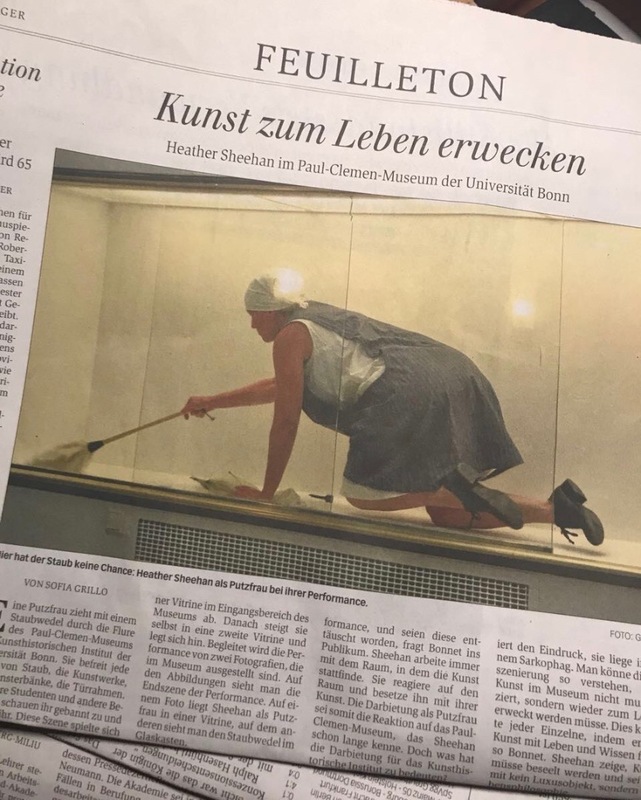 Heather Sheehan Makes More Than Just Selfies In the Augsburger Allgemeine newspaper, Judith Roderfeld describes the opening performance during which the artist transforms from photographer to the fictional character she shoots with her camera and her confrontation with the multimedia works of Heather Sheehan at the Claudia Weil Galerie II in Augsburg Göggingen. Abtauchen im Zeichenfluss: Michael Schreiner reviews Heather Sheehan's 2015 solo exhibition: 'alighting' at the Kunstverein Augsburg, Augsburg, Germany. kreislauf-des-lebens Review with video still image from Heather Sheehan's 2015 solo exhibition: 'alighting' at the Kunstverein Augsburg, Augsburg, Germany. Warm Bundles: The art historian, Anke Humpeneder-Graf reviews Heather Sheehan's 2015 exhibition, 'Barking the Willow', performance, installation and photography in the Neue Galerie Landshut, Bavaria, Germany. One wall in Cologne: rheinische ART July 2014 review of Heather Sheehan's wall drawing exhibition at project room: selected art models. Text in German. Sculpture in former Synagoge: Karin Prignitz nw-news article, 'Fremde Freunde' reviews Heather Sheehan's solo 2012 sculpture exhibition in the Kunstverein Oerlinghausen, Oerlinghausen, Germany. Text in German. Visitors in NYC NY Culture Beat review of Heather Sheehan's 2012, exhibition at Sylvia Wald & Po Kim Foundation Gallery, New York, New York, USA. photos. Article in Korean by Susie Park. Marion Gay review of exhibition at Stadtmuseum Beckum: In depth review of Heather Sheehan's 7 room sculpture and drawing exhibition, in 2011. Text in German. As Beautiful As an Old Elephant Jürgen Röhrig reviews of Heather Sheehan's 200 square meter sculpture and drawing exhibition, at the City Museum of Siegburg, Germany, in 2011. Text in German. Devious Little Stuffed Animals: The art historian, Anke Humpeneder reviews Heather Sheehan's 2009 exhibition of the sculpture series: 'beings' installed in the Neue Galerie Landshut, Bavaria, Germany.